You've almost certainly heard this before: a mysterious caller on your phone claims to be from the IRS, demanding payment for back taxes. The caller may even threaten you with a lawsuit or imminent arrest. Of course, it's a scam. But the calls keep coming, as thieves hope to catch at least a few victims who will fearfully buy into the con and hand over their hard-earned money. First Orion, a mobile phone security firm, monitors the nationwide surge in scam calls. In its new consumer survey released Tuesday, it found nearly every phone user in America reports being targeted by scammers. 94% of all mobile phone users report receiving at least one scam call. 64% received a scam call within the last week, double the number from a similar 2018 survey. 40% heard from a scammer claiming to be with the IRS. 53% say they get more scam calls than legitimate calls. 2.9% admit they gave their Social Security number to a scam caller. 2.6% say they shared a credit card number. 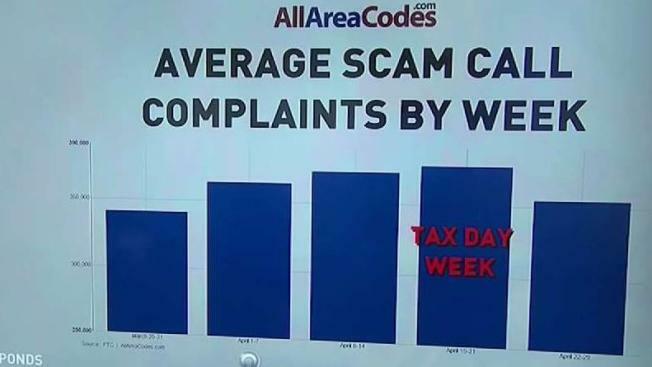 24% received at least 50 scam calls over the past six months. First Orion said it expects an increase in such calls following Monday's federal tax filing deadline. That mirrors the findings of researchers working for AllAreaCodes.com, an online phone directory. It recently reported consumer complaints about unwanted robocalls jump 20% in March and April, with complaints peaking during the period of April 15 - 21. The AllAreaCodes.com study noted a concentration of such complaints in the Bay Area, with San Francisco ranked second among all counties nationwide for unwanted call complaints per capita. Also in the top 100 were San Mateo County at 24; Santa Clara County at 36; and Alameda County at 38.